MICROSOFT has officially confirmed multiple new Xbox consoles are on the way. We've tracked down the latest Xbox Two news and rumours circulating online, plus the latest E3 2018 news - here's what we know. 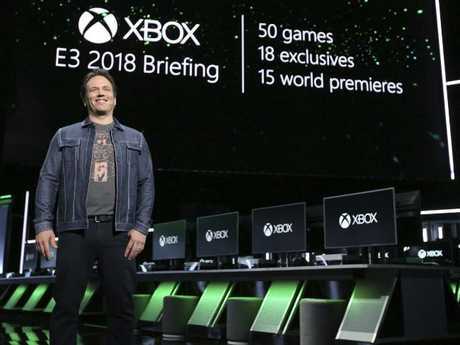 At the end of Microsoft's E3 2018 conference, Xbox boss Phil Spencer officially confirmed that a new Xbox is on the way, reports The Sun. He revealed that his team is "deep into architecting the next Xbox consoles" - yes, that's more than one. XBOX TWO RELEASE DATE - WHEN IS THE XBOX 2 OUT? Sony is playing at a similarly frantic tempo with its own console releases, because both companies have realised that they can mimic the smartphone sales model - offer a few performance upgrades, and convince some gamers to upgrade every year or two. Based on previous PlayStation launches, the PS5 looks likely to arrive in 2019. If this happens, Microsoft will almost certainly debut a new console within a year of Sony's reveal. Of course, there's no guarantee that Microsoft will keep pace with Sony - or even the company's own rapid release pace. If we had to guess, we'd say expect a new console in 2019. XBOX TWO NEWS AND SPECS RUMOURS - WHAT DO WE KNOW ABOUT XBOX 2 FEATURES, GAMES AND GRAPHICS? It can play video games at a native 4K resolution, and can play 4K Blu-ray discs - the latter feature is missing on the PS4 Pro. It's also possible that Microsoft will produce two versions of the Xbox - a premium, supercharged model, and a cheaper, less graphics-intensive version for casual gamers. Microsoft also faces the obvious gap of VR and AR. Sony doubled down on virtual reality with its PlayStation VR platform, but Microsoft hasn't made any noise about VR for the Xbox. However, Microsoft has long been working on the HoloLens augmented reality headset, which lets you overlay virtual objects onto your real-world environment. It's likely that Microsoft will be looking at ways of integrated its HoloLens AR technology into a future Xbox, although nothing is confirmed on that front. Microsoft will probably debut its new console with some launch exclusives too - so count on a new Halo game turning up alongside the next-generation Xbox.